Brad Keselowski passed leader Autsin Dillon with 11 laps to go and hung on to win Saturday’s XFINITY Series race at Texas Motor Speedway. The victory was the 34th of the Team Penske driver’s career in the series. It was his second win of the season and second at TMS’s 1.5-mile quad-oval. Kevin Harvick passed Dillon with five laps to go and went on to finish second. Dillon held off Erik Jones, the series points leader, to finish third. Series points leader Chris Buescher finished 11th. Harvick inherited the lead when Kyle Larson blew a tire with 24 laps to go but on the ensuing caution, Dillon came out of the pits with the lead. That set up the race-winning pass. Buescher will head to Phoenix next weekend 24 points in front of Chase Elliott and 30 in front of Ty Dillon. 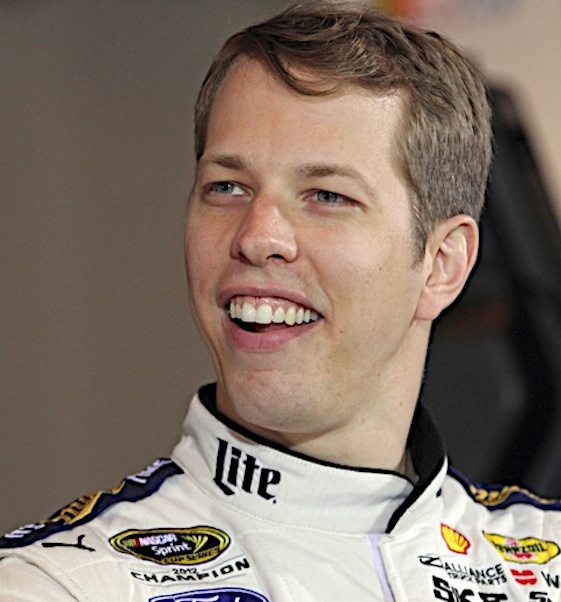 (2) Brad Keselowski(i), Ford, 200, $74829. (8) Kevin Harvick(i), Chevrolet, 200, $56590. (1) Austin Dillon(i), Chevrolet, 200, $47982. (3) Erik Jones(i), Toyota, 200, $43341. (9) Ty Dillon, Chevrolet, 200, $35321. (5) Daniel Suarez #, Toyota, 200, $33389. (11) Brian Scott, Chevrolet, 200, $30662. (10) Chase Elliott, Chevrolet, 200, $30590. (4) Regan Smith, Chevrolet, 200, $28454. (14) Elliott Sadler, Ford, 200, $30317. (12) Chris Buescher, Ford, 200, $26711. (13) Brendan Gaughan, Chevrolet, 200, $26155. (18) Ryan Sieg, Chevrolet, 200, $25624. (6) Kyle Busch(i), Toyota, 200, $19195. (17) Ryan Reed, Ford, 200, $25567. (24) Ross Chastain #, Chevrolet, 200, $24841. (20) Jeremy Clements, Chevrolet, 200, $24715. (19) Dakoda Armstrong, Ford, 200, $24589. (7) Darrell Wallace Jr. #, Ford, 199, $24462. (23) Ryan Truex, Ford, 199, $24836. (25) Blake Koch, Toyota, 198, $24210. (21) Landon Cassill, Chevrolet, 198, $24078. (15) JJ Yeley, Toyota, 197, $23927. (26) Mason Mingus(i), Chevrolet, 195, $23775. (32) David Starr, Toyota, 194, $23774. (30) Joey Gase, Chevrolet, 193, $23497. (22) Ray Black Jr.(i), Chevrolet, 192, $23371. (33) Eric McClure, Toyota, 190, $23245. (38) Martin Roy, Chevrolet, 190, $23169. (29) Derrike Cope, Chevrolet, 189, $17419. (37) Derek White, Chevrolet, 188, $23063. (39) Mike Harmon, Dodge, 180, $23002. (16) Kyle Larson(i), Chevrolet, Accident, 178, $16962. (35) Harrison Rhodes #, Chevrolet, Engine, 102, $22927. (31) Morgan Shepherd, Chevrolet, Handling, 42, $16863. (28) Mike Bliss, Toyota, Transmission, 40, $21200. (36) Josh Reaume #, Dodge, Suspension, 14, $14200. (27) TJ Bell(i), Toyota, Electrical, 12, $19200. (40) Mario Gosselin, Chevrolet, Vibration, 9, $12200. (34) Jeff Green, Toyota, Transmission, 4, $11200. Average Speed of Race Winner: 139.607 mph. Time of Race: 02 Hrs, 08 Mins, 56 Secs. Margin of Victory: 1.137 Seconds. Lap Leaders: A. Dillon(i) 0; B. Keselowski(i) 1-8; A. Dillon(i) 9-54; K. Busch(i) 55-59; K. Harvick(i) 60-78; K. Busch(i) 79; B. Keselowski(i) 80-117; K. Larson(i) 118-121; B. Keselowski(i) 122-123; K. Larson(i) 124-163; B. Keselowski(i) 164-165; R. Sieg 166; D. Armstrong 167-169; K. Larson(i) 170-175; K. Harvick(i) 176-180; B. Keselowski(i) 181; A. Dillon(i) 182-189; B. Keselowski(i) 190-200. Leaders Summary (Driver, Times Lead, Laps Led): B. Keselowski(i) 6 times for 62 laps; A. Dillon(i) 2 times for 54 laps; K. Larson(i) 3 times for 50 laps; K. Harvick(i) 2 times for 24 laps; K. Busch(i) 2 times for 6 laps; D. Armstrong 1 time for 3 laps; R. Sieg 1 time for 1 lap. Top 10 in Points: C. Buescher – 1,126; C. Elliott – 1,102; T. Dillon – 1,096; R. Smith – 1,095; E. Sadler – 1,008; D. Wallace Jr. # – 1,001; D. Suarez # – 1,000; B. Scott – 959; B. Gaughan – 959; R. Reed – 854.